LRG Fundamentals is a complete mission makers tool, used to create complex missions with ease. Using the huge Library of functions, settings and modules you can create almost any type of mission. LRG Fundamentals is designed to be entirely modular, meaning you can use as much or as little as you want. By default, the master switches are set to off so only what you want to use will be used. See the Key features below for further details. LRG Fundamentals has been used by the LRG in one form or another for nearly 3 years. At the turn of 2019 we decided to publish our work and make all our files open source. That means your free to download, edit, change and create your own work, based on what's we've already made. More information on available functions and features as well as our functions library, our Wiki is available here. If you want to find out more about LRG Fundamentals or about the community itself, the best way to get in touch is to join our Discord Server. If you come across any issues, have an idea for an improvement or simply want another faction added to the AI Spawn module, please submit your request here. Tweak - Earplugs - Added duplication check. Tweak - Backend Postinit functions replaced by CBA_Settings call. Added Option to Show/Hide own Group only. Changed to use Object Bounding Box for Servicing area instead of being defined. v1.3.7 released with CBA Settings for QS Icons. Very nice and easy to use. Is caching of spawned ai units possible or planned for the future? Adding more factions isn't an issue so we can get on to that. If you have specific factions you want adding, submit it using the AI Spawn Faction Request. The future of the Spawn AI module is very much in development. We're looking at making it more dynamic, so you can include any Faction you want, without us having to define it. We'd also like to add the option to use the module within Zeus, which again would be really useful! The bad news is this will take some considerable work and the majority of the function would need change. Now that the Addon Settings are done we're just finishing up Attributes, then we can circle back to the beast that is Spawn AI. None the less, we're on it and we'll continue to add factions as and when we can. 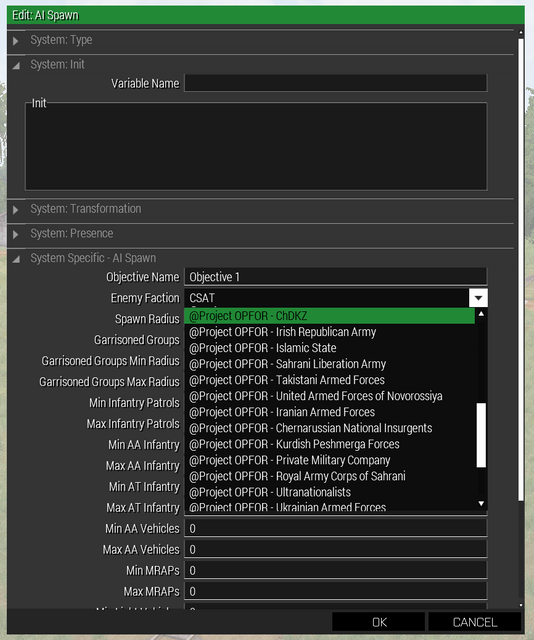 We've added 18 new factions from @Project OPFOR to the AI Spawn module in v1.4.3 which is now live on The Steam Workshop. Just curious, any chance you'll add support for ACRE2 in the future? I know your group uses TFAR but for groups that perfer ACRE2 that'd be cool. I'll add it to my to do list. I'm not very familiar with ACRE so will do a bit of investigating. Added another 24 Factions, including additional 3CB, CUP, RHS AFRF, RHS GREF and RHS SAF, bringing the total preset faction count to over 60. Just a heads up we've just released our Vanilla Public Warlords Sever. This has many features of LRG Fundamentals within a Vanilla Mission files. We're working on an RHS version which will include LRG Fundamentals as a mod so you can see the full functionality of Fundamentals on one of our servers. We'll of course be releasing our mission files publicly so you can use them on your own servers. Further details will follow in due course but in the mean time, feel free to check it out. Sorry for asking... Will be a possibility in future to add IFA3 factions in your awesome mod? So we will can play World War II random missions. That would be so cool! Thanks again for your great mod! I'm pleased to announce LRG RHS Warlords is now officially live. It went live on Friday and by the end of the weekend was the highest ranked community made Warlords Server. 🙌 It's built around LRG Fundamentals so if you want to see what this mod can do, check it out! Further information available on LRG RHS Warlords BIS Page. I'll check it out. The issue could be that vehicles and infantry are different factions, it's not the best setup!